ROME - THE new pope is not the only leader whose future has been in the balance in Rome this week. Across the Tiber, Italy's prime minister, Silvio Berlusconi, handed in his resignation on April 20th, bringing to an end the longest-serving government in Italy since 1945. Not that Mr Berlusconi was planning to leave office. Under the constitution, a change of government is required before any big shake-up—which is what two of his key centre-right allies have been demanding for the past week. At the root of the crisis was the centre-right's disastrous showing in Italy's recent regional elections. On April 3rd and 4th, it lost in all but two of 13 regional votes. This week, it was defeated in a 14th, Basilicata. Italy's voters are clearly telling the government it is on the wrong track. But the prime minister and his allies have little time left to find the right one. A general election is due by May 2006, and there is no sign that the dismal economy will improve much before then. 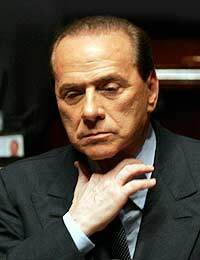 Mr Berlusconi still seems convinced that his existing policies will work, economically and politically, if given time. The centrepiece is his plan for the progressive reduction of income tax. The biggest cut, worth €12 billion ($16 billion), has been announced but not yet implemented. But his allies (to say nothing of the European Commission) are worried that these tax cuts cannot be afforded—and it remains to be seen if they will form part of a new government's programme. The prime minister's first response to the regional elections was to propose a minor cabinet reshuffle. That was not enough for the Union of Christian Democrats (UDC), the third-biggest party in government. The UDC's leader, Marco Follini, one of Mr Berlusconi's two deputies, urged a clean break to show voters that the government was changing direction. With hesitant support from Gianfranco Fini, the other deputy prime minister and leader of the second-biggest coalition party, the formerly neo-fascist National Alliance, Mr Follini demanded that the prime minister resign, rewrite his programme, reshape his cabinet, and go back to parliament for a fresh vote of confidence. When Mr Berlusconi refused, the UDC leadership said on April 15th that it would pull out of the cabinet, though it would continue to support the prime minister in parliament. After a hectic weekend, Mr Berlusconi agreed, at a meeting of party leaders, to hand in his resignation to President Carlo Azeglio Ciampi. He set off to do this, only to emerge with an impish grin and a statement that he had changed his mind. His about-turn snapped the patience of Mr Fini, who said that he would pull his party out of the government unless Mr Berlusconi gave way. This battle has been largely over tactics, but the surface hides layers of substance. One question is the real aim of the UDC, long the most suspect of Mr Berlusconi's allies. The earthquake that shook Italian politics in the early 1990s scattered the Christian Democrats into rival camps. Mr Follini and his friends sided with Mr Berlusconi; others chose to ally with the left. The prime minister's followers have long feared that Mr Follini's ambition is to reunite the wings of Christian Democracy into a movement that could recapture the middle ground—perhaps after a Berlusconi defeat and a spell in opposition. Italy's halting progress towards a more liberal economy and a two-party, or at least two-sided, democracy on Anglo-Saxon lines may thus be in question, since both would be blocked by the re-creation of an all-embracing Christian Democrat party. The UDC, like the National Alliance, is rooted in the poorer, more welfare-dependent, south where fears about Mr Berlusconi's agenda have been heightened by another part of his programme: a constitutional reform that would boost the autonomy (and also the resources) of the richer, more entrepreneurial north. Although it may not seem like it at first, Italy's political crisis in part reflects the wider debate over how far to go in replacing Europe's social model with American-inspired free-market principles. The debate has real substance. Not that that will stop Mr Berlusconi thinking Mr Follini is a rat. Or Mr Follini from fearing that he may be re-boarding a sinking ship.